Exclusive Win 2 Alton Towers Annual Passes at Alton Towers Enter now to be in the chance to win and enjoy free entry for 2 for a whole year at Alton Towers! £25 Tickets for Students at Alton Towers Students, you can make a massive saving at Alton Towers today! Click the link to find out more. 1 Day Pass from £33 with Online Bookings at Alton Towers The early bird gets the deal at Alton Towers! Book 5 days in advance and you can save over £20 off the cost! Up to 35% Off Online Group Bookings at Alton Towers Plan a large expedition to rides unknown and find yourself with plenty of spare change in your pocket at Alton Towers. 1 Day Pass with Entry to the New Alton Towers Dungeon Attraction from £38 at Alton Towers Be prepared to get scared! Check out the new Alton Towers Dungeon attraction with a ticket to the main park from £38 when booking online! Take advantage and save with online bookings. Up to 40% Off Holidays with the Merlin Annual Pass at Alton Towers If you're an Alton Towers fanatic, consider the Merlin Annual Pass where you can save up to 40%! Second Day Theme Park Entry Free with Alton Tower Holiday Bookings at Alton Towers What's not to love about this great offer? Start planning your break now! Ride Hex, Wicker Man and Nemesis from £33 at Alton Towers Explore some of the nation's finest and most exhilarating rides for as cheap as £33 when purchasing an online day ticket. Under 3's Go Free at Alton Towers Give your little one some thrilling memories and at no extra cost at Alton Towers. 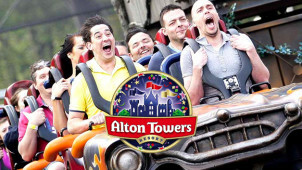 2019 Season Pass from £56 at Alton Towers Take one trip and come back for free all season thanks to the fantastic price on the Alton Towers season pass. Alton Towers offers a number of rides that you won’t find anywhere else. For those looking to travel through space and explore other dimensions, check out Galactica, the only Virtual Reality rollercoaster in the world! Or if you want to conquer your fears and do something scary, see if you can handle Oblivion, a vertical drop rollercoaster with a massive 180-foot drop to make your stomach turn! There are also plenty of family-friendly rides like Cuckoo Cars Driving School and the Frog Hopper. Alton Towers is easy to reach from all parts of the UK and offers a range of ticket types and accommodation offers to suit all budgets and family sizes. Hosting events throughout the year, including Halloween, Fireworks Night and Christmas, Alton Towers offers packages for schools, groups, and conferences, as well as dining options located all around the park, making it the perfect year-round fun-filled holiday destination, whatever the occasion. How do I use my Alton Towers offers? Click on the Alton Towers link via our website. Select the ticket type you want then choose your preferred date and click 'Buy Now' and confirm the date. Any vouchercloud discount will automatically be included in your booking. If you're feeling squeezed for time, why not check out Alton Towers' many hotel deals and spend an extra day in the theme park? Alton Towers is in Staffordshire, between the M1 and M6, therefore easily accessible by car. Car parking is available at £6 per car. It can also be reached by rail. Stoke-on-Trent railway station is 15 minutes away. Alton Towers can also be reached by buses from Stoke-on-Trent, Nottingham & Derby. Full travel details can be found here. Is Alton Towers accessible to disabled visitors? Alton Towers is committed to ensuring that the theme park, accommodation, and waterpark are fully accessible to all. More detailed information about the park’s accessibility policies can be found here. Tickets can be purchased on the day, though it is advisable to buy in advance. The full range of ticket offers can be seen here. Where can I find information on Alton Towers events? You can find its complete list of events here, including some amazing activities for the holidays. Can I stay overnight at Alton Towers? Absolutely, it has a number of comfortable hotels onsite to prolong your stay. For ticket bookings only, please call 0871 2222 800. For ticket and hotel packages, please call 0871 360 2521. If you need to cancel your booking in the Alton Towers Spa, please give 24 hours notice to receive a full refund. Alton Towers is usually open daily from 10 am - 5 pm. You can see more detailed info about opening times throughout the year here. Alton Towers is the UK’s premier theme park, offering more than 50 attractions and activities including some of Britain’s best roller coasters. Spend an awesome day out this summer with all the family and get a chance to explore thrilling rides such as Galactica, Nemesis and Oblivion. With Alton Towers offers you could also take a trip to the waterpark, relax in an on-site restaurant or even stay in a hotel! Grab yours now and save on your next family outing or group excursion. Alton Towers has been offering nail-biting days out for Britain’s families since 1980. There is fun for all ages, including an Enchanted Forest Tree Top Quest, and even a spa - for parents who want to relax while the kids are off having adventures! And while providing thrilling rides is the park’s goal, safety is a top priority: regular ride testing and ride safety technology is in use to keep you and your family safe on your day out. The Wicker Man - unveiled to thrill-seekers everywhere in 2018 - allows the Chosen Ones among you to speed through a 6 storey effigy in the world’s first rollercoaster experience to fuse wood and fire. Get your entry for less with the Alton Towers vouchers from vouchercloud and you’ll experience this unique summer attraction for less. A multisensory experience you won’t forget in a hurry, this flamed filled coaster is sure to reignite the passion for thrill seekers everywhere.